I’m only on episode 10, but totally digging You’re All Surrounded, a summer police drama from 2014. It’s part procedural crime solving, part comedy, part mystery, part romance, and on the whole, a lot of fun to watch. The opening credits are campy, with 70’s inspired music and comic book backdrops of explosions and fights. The story follows a set of four new detective recruits fresh out of the academy to the famous Gangnam police district. They are: Eun Dae-koo (Li Seung-Gi), Eo Soo-Sun (Go Ara), Park Tae-Il (Ahn Jae-Hyeon), and Ji Kook (Park Jung-Min). Eo, Park, and Kook all seem to have normal reasons for wanting to work as detectives in Gangnam (they do have some secrets, of course), but Eun has an obvious hatred of the leader of their unit, Seo Pan-Seek (Cha Seung-Won). His immediate and obvious attempts to provoke such an accomplished detective are both alarming and entertaining to watch. The long arc of the series is Eun’s problem with his boss: Years ago, when he was in Junior High, Eun’s mother, a key witness to a crime, was brutally murdered. Seo was the detective on the case, and from the events of that time, Eun is convinced he’s either the killer or in cahoots with him. Add to that the fact that Eun is hiding his true identity to stalk Seo, and has trouble doing so, as an annoying girl from his neighborhood, Eo Soo-Sun, is also a new recruit. Being a fan of American procedural crime shows like CSI and Criminal Minds, I find it neat to see how a similar show may be handled in other countries. You’re All Surrounded has the added benefits of comedy, and that Kdrama staple, romance (plus the fact that it’s only one season). The detective work is mixed not only with the bigger show arc, but with cute romances, heartbreaking drama, and unexpected twists. For example, in one episode the four recruits have made a few blunders and go out to a mom and pop noodle shop and end up hostages of a desperate, suicidal man–who wields a blurry knife. They blur out the knives but not the guns, I don’t get it. 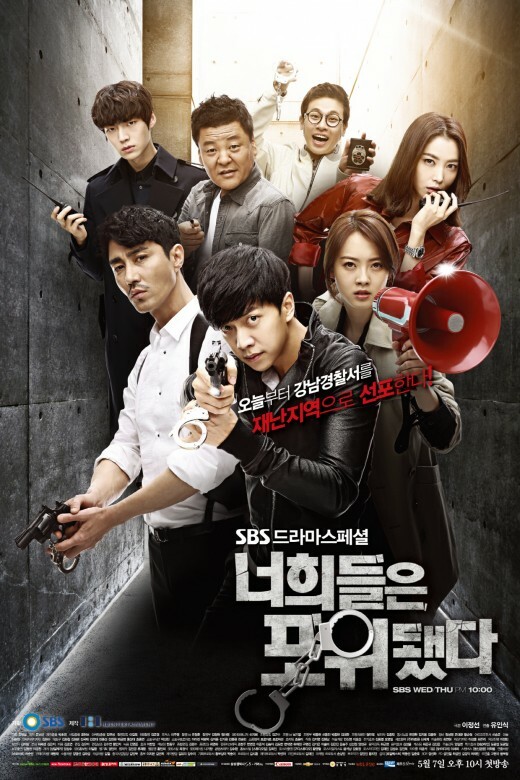 The best part of the show is outstanding acting by Cha Seung-Won as Detective Seo, and Li Seung-Gi as Eun. As a veteran actor, Cha is at the top of his game, looking handsomely weathered, and a perfect choice to play the boss/older brother/father figure to the new recruits. He and Sung Ji-Ru (as Lee Eung-Do, the other lead detective) seem a perfect match for their characters who do their best to not tear their hair out as they try and teach the ropes to the kiddos. Li Seung-Gi is an actor to watch, as he has the ability to command the screen even though his character Eun holds his emotions and even facial expressions close to the chest most of the time. Eun’s understatement is balanced by the super expressive and goofy Eo and Kook, and underscored by Park, whose pretty boy character has a smooth calmness about him. I am excited to finish this series and find out what happens. I’m on pins and needles trying to figure out just what is going on with the head of police – Is she good? Is she evil? – and how the budding romance between Eun and Eo will turn out. If you like quirky Kdramas and crime procedurals, check this one out on Viki or Dramafever. ← Into the Wild: Fairy Tales Run Amok!